This week we look at Mary in two ways. First, we explore the 100th anniversary of Our Lady’s appearance in 1917 to three peasant children in Fatima, Portugal. Second, we explore a mother’s life with the help and assistance of Mary — especially during times of great sufferings and trials. My guest is Judy Klein, who shares her story with us, as found in her latest book, Mary’s Way: The Power of Entrusting Your Child to God. 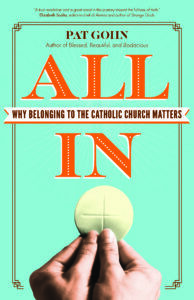 “The Motherhood of the Church” – Excerpt from ALL IN: Why Belonging to the Catholic Church Matters at CatholicMom.com.